I know a lot of ladies wanted to know what my consultant used for the style in the photo shoot. Well here is a picture with the rods still in my hair and a pic after the shoot. I bought a few packs from Sally Beauty Supply so I could try this style again...without the makeup. Your makeup and locks is looking good! Very very lovely. Thanks for the update. How long did your curls last and how long did you have to sit under the dryer. Did she use setting lotion? Sorry for all the questions, but I'm just now journeying into the land of rollers and curls. Thanks! I don't mind the questions. They lasted a week. I actually washed it out last night. They had fallen a great deal but it was still a lot of body to it. I believed she used a product by Taliah Waajid to dampen the hair. I sat for about an hour or so. I love that pink top. You look very classy. Your hair matches the whole ensemble. Very nice! Love the set! You make me feel like a lazy bump for not setting my own hair. I'm in a was and go rut. Oop-skee! With our without the make up you look beautiful!! I cant wait till my hairs grows! sorry I 4got to add, do you mind posting pictures, of the rollers. Thanks for the information about what she used to roll your hair. I am going to try this roller set. Your hair looks just beautiful. I know your husband can't keep his hands off of you (tee,hee). 2 set you hair,I know it was the bomb! 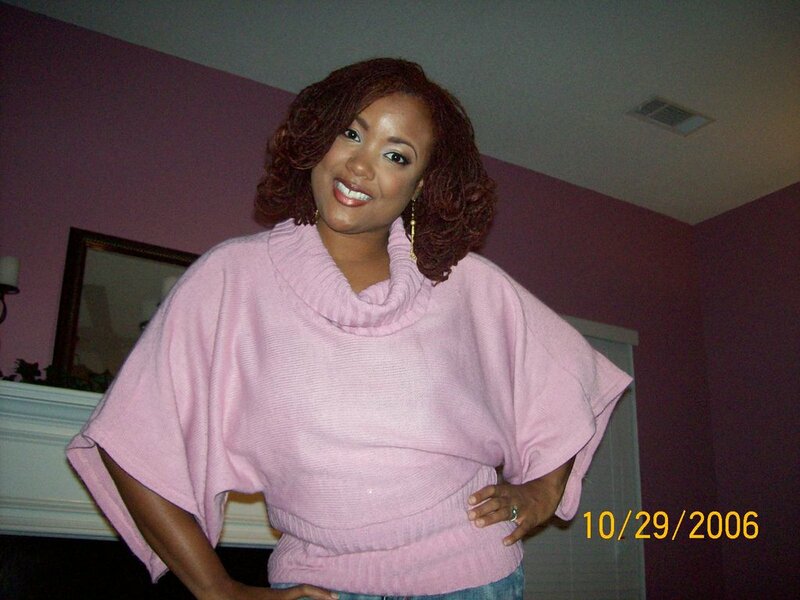 i love the bodifier!i cant wait until my lox set so i can use her products again.you are working that pink and green,soror!you and your hair are beautiful! No, she is working on creating a website at this time. When it's up and running I will be sure to post it. If you want her info just let me know. Yes, if you could email me her info to andrea.m.baker@delta.com that would be great. Thanks! Nevermind, I was looking through old emails and see I already have Ms D's information. Thanks! You got them at Sally's you said? Thanks! 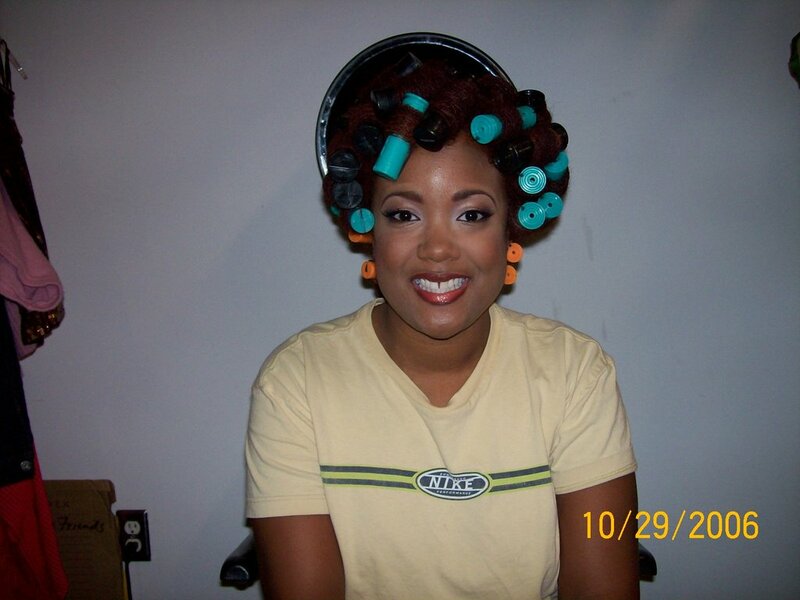 I don't know where the rollers from the photos came from but I bought some from Sally's. Once my hair became your length I could not get a good set. I started using white pipe cleaner you purchased at Michaels. Cut it in half and roll up four to five locs at a time. It is tedious but keeps for five days. I love the permed look! Wonderful pictures. I think that if you still want to have that natural look you need to use natural hair care products. I've noticed a big difference when using them.